We are still eating our way through the frozen nettle pesto and to be honest it is becoming a challenge to reinvent it to keep it interesting. Stilton and bacon are a pretty winning combination, although not an especially healthy one, this meal would be perfect as a mid-week treat after a bad day at work. I make up a basic risotto with 1.25l of stock and 200g risotto rice and then throw in two cubes of the pesto when the rice is nearly cooked. The main thing here is getting the bacon nice and crispy. Before putting starting to cook the risotto, I pre heat the oven to 250°C and lay the bacon; 3 rashers per person, (it must be streaky for this to work), on a cooling rack on a tray. It’s also important to make sure the rashers don’t over lap, this will stop them crisping and they will just be chewy (not desirable)! Oven the oven is up to temperature the bacon should take 30 min to crisp up but will need a few minutes out of the oven to crisp up completely, so you will have loads of time to make the risotto. 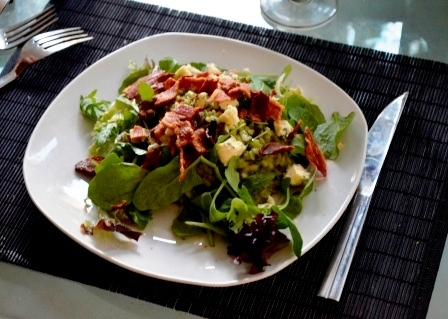 When it’s ready, crumble the bacon and Stilton over the risotto and maybe add some salad leaves in a nod healthy eating! This is only a partly formed recipe, no measurements as yet, but I wanted to post it as a thank you to Johannes who encouraged me to give geitost another chance. You can read the discussion here but is seems I underestimated its uses. As we had a lot of the ingredients Johannes mentioned and a lot of cheese left I had a go at putting something together. I part cooked some venison sausages in a frying pan them put in the oven to continue cooking and then in the same pan gently cooked some mushrooms. When these were part cooked I de glazed the pan with stock, (but white wine or cider would also work really well) and allowed everything to simmer of a bit (not very specific I know) until the sausages were cooked. Just before serving I stirred in the grated cheese, some spinach, cooked squash (I’d had to defrost the freezer earlier in the day) and a tablespoon of creme fraiche. As well as being a massive amount of food for two people, (probably because I busked the recipe), it was incredibly tasty. 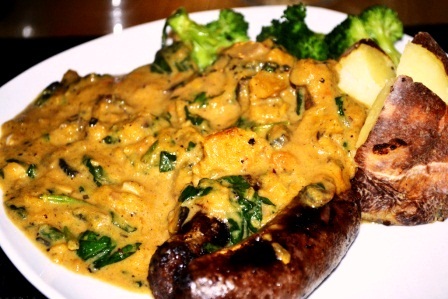 The sweetness of the cheese worked with the sweetness of the squash and whilst the sauce did have a lactic tang it didn’t seem out-of-place and if anything it helped cut through the richness of the sausages. 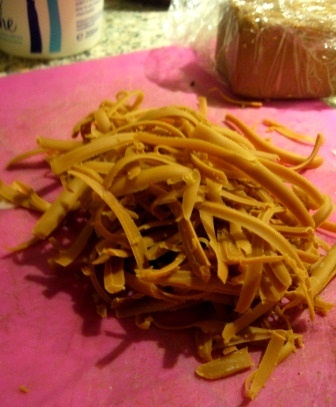 The mushrooms and stock also added a deeply savoury flavour and a good punch of umami along with the cheese. It was very filling, a real winter warmer, and really I don’t think it needed the squash, but it needed using up and next time I will pay more attention to the quantity I’m making, but it was a pretty impressive result for something I had written off as not for me. Thanks Johannes! More adventures in cheese and definitely not a healthy recipe; but a tasty one none the less! 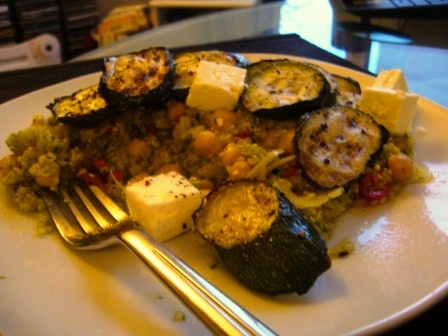 Marinated goats cheese is very easy and very delicious, the recipe is a mixture of one’s found by Googleing the idea. I used a small log of fairly mild goats cheese, but I imagine more robust flavours would work but the herbs and spices would need adjusting to taste. I cut the cheese into small rounds and placed in a Tupperware box. I then and added a finely chopped red chilli, a minced clove of garlic, a finely chopped sprig of rosemary, the same amount of thyme, a chopped fresh red chilli and a few strips of lemon zest. Pour over enough olive oil to completely and leave in the fridge for at least two days. It was great with salad, with toasted bread and even as a pizza topping. Make sure you drain the oil off the cheese thoroughly before serving, you can keep the oil in a jar in the fridge to use as a dressing or to flavour other dishes. It’s cheese, but not as we know it! 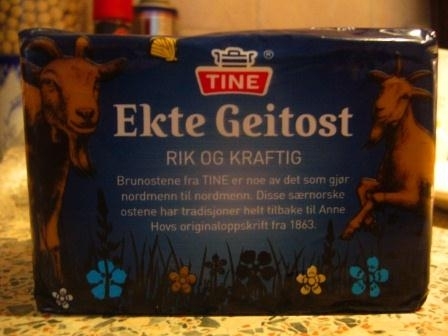 Geitost (pronounced yay-tost) is a goats cheese, so far so good I like goats cheese a lot. This however is totally different; for a start it is made from whey, milk and cream. These are then carefully boiled for hours until the sugars in the milk begin to caramelise giving Geitost a unique colour and taste. It isn’t stored or aged like many cheeses so can be eaten straight away. 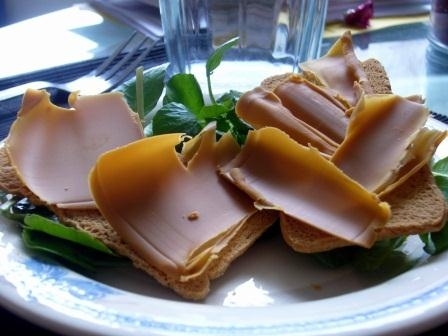 In Norway it is often eaten, thinly sliced, for breakfast I tried looking for recipes using it but drew a blank; if anyone knows of any I would be interested to hear them. I had mine for lunch so it wasn’t totally authentic but never mind. So what was it like? Odd was my first reaction! It looks like fudge, it smells a bit like fudge, but with a cheesy edge to it and initially it tastes a bit like fudge too. Then you get a sharper altogether more goaty tang that my taste buds weren’t quite prepared for after the smooth texture and sweet beginning. I didn’t not like it and it certainly isn’t on my list of cheeses to avoid; so far this only includes Stinking Bishop which I’m afraid tasted to me like something had crawled into my mouth and died there. So the jury is out, maybe it’s one to file under acquired taste. I’ve come to realise that I have quite a serious cheese habit, it’s pretty broad ranging; taking in anything American and nacho cheese flavored to bank the breaking and artisan, and pretty much every thing in between. Put me in a cheese shop and I’m happy. Let’s face it cheese is never going to be a health food, but being a firm believer in a little of what you fancy doing you good, occasionally I throw caution to the wind and make something totally artery furring but delicious. 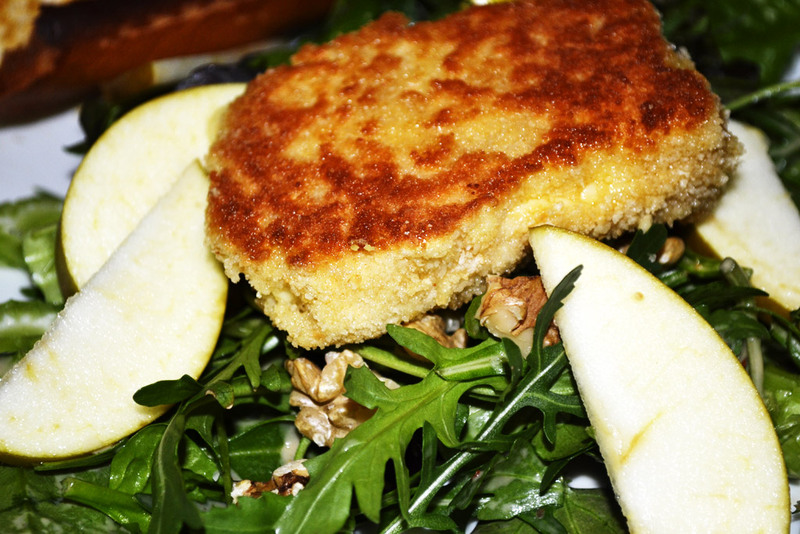 This weekend it was a fried cheese salad, using a gorgeous piece of Gubbeen that The Man and I picked up at the market in St Albans. St Albans has a really lively market and a wonderful cheese stall run but two guys who obviously know their stuff and are happy to give advice and tasters. Gubbeen is a cheese I hadn’t tried before, but is a semi-soft ring washed cheese from Ireland, creamy with I thought a slight tang and The Man felt, a slight barnyard smell; but by other cheese standards nothing terrifying! 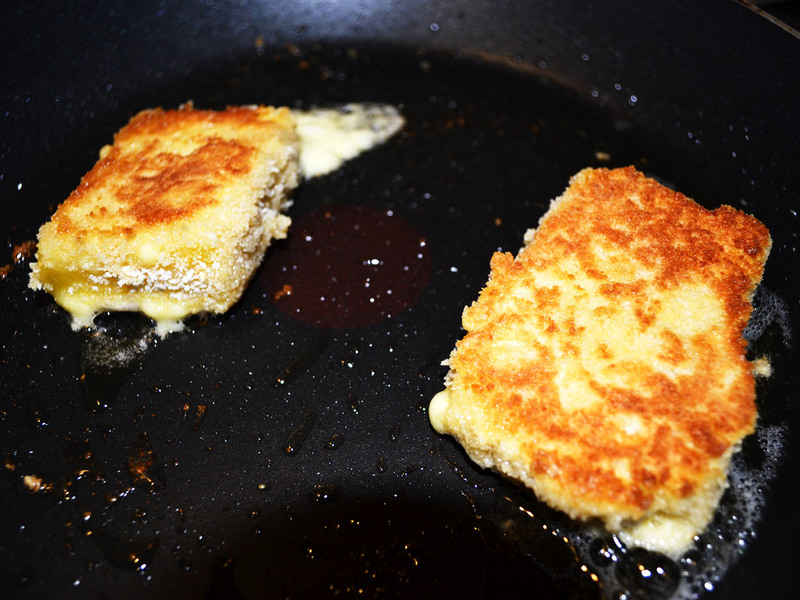 A quick Google suggested it would fry just fine, so after dusting in flour, egg and bread crumb I fried it for a few minutes on each side until it was runny but still holding its shape. I served it with a tangy salad of leaves, celery, apple and walnuts to cut through the creamy cheese and it was gorgeous, even The Man got over his “barnyard” reservations and loved it. A rewind to summer on the allotment because it’s too cold to dig much up at the moment with the ground frozen solid. 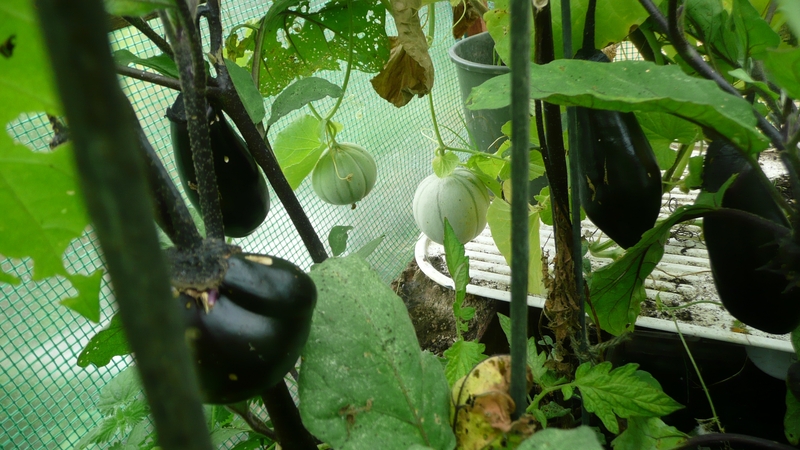 We have tried to grow aubergines twice, last year wasn’t a success. This year with a better green house and ( a bit more warm weather) we managed to grow these beauties. I wanted a recipe which would show off the aubergines, many books suggest salting aubergines to draw out any bitterness but modern varieties have been developed not to have this bitterness. 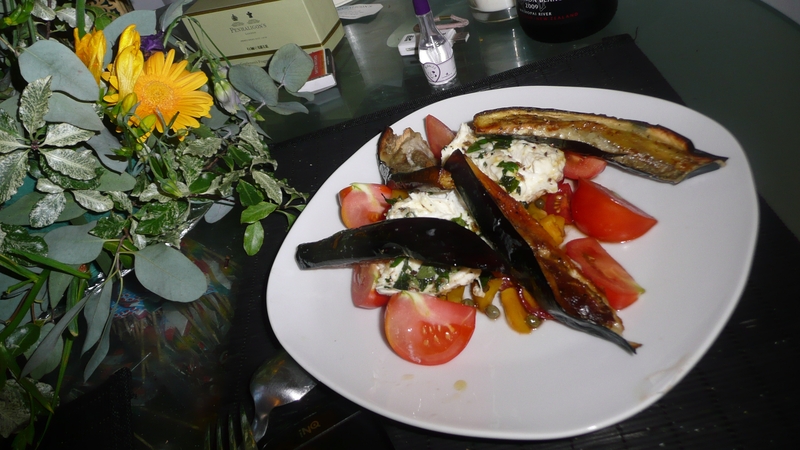 I simply roasted the aubergines untill they were soft (they are done when the flesh starts to collapse) and ate them with Yotam Ottolenghi’s Marinated mozzarella. A wonky picture of a delicious supper, not sure how much wine The Man and I had drunk before this got to the table but it looks like quite a lot! 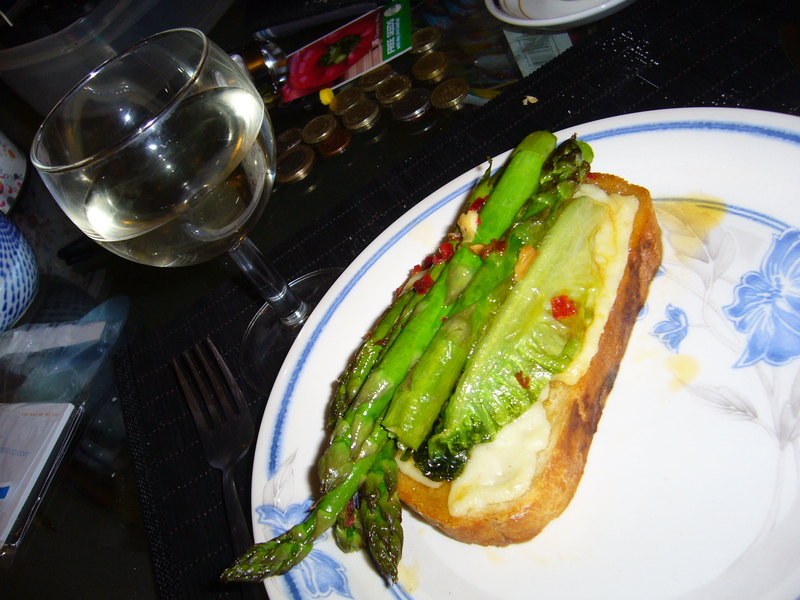 This is a retrospective post as I made this in spring using British Asparagus, it tastes so much better than anything flown in because it doesn’t have to travel as far so is fresher when it gets to you. Very simply I fried the asparagus with olive oil, garlic and chilli until just about cooked and then added half a little gem lettuce per serving and cooked untill there is still a bit of crunch in everything (I had reservations about cooked lettuce but trust me its great). Served on top of a chunky slice of toasted bread and Caerphilly cheese it makes a gorgeous quick supper.